This vanity is a great way to add traditional style to your bathroom. This piece comes with a beautiful brown solid wood base and a beige tan marble counter. Make your bathroom look like new with this good-looking, useful set from Wyndham Collection. Use this vanity to bring more modern style into your bathroom. Its beautiful beige tan marble counter and brown solid wood base bring a great new look into your bathroom. Add a classic feel to your bathroom with this simple vanity set from Wyndham Collection. For some added modern style in your bathroom, choose this beautiful vanity. Its beautiful beige tan marble counter and brown solid wood base bring a great new look into your bathroom. Put a nice touch on your bathroom's look with this vanity set from Wyndham Collection. Designed with a modern style and strong build, this vanity is a perfect choice for any bathroom. Its beige tan marble counter and brown solid wood base will look beautiful in your home. Bring a classic look and feel to your bathroom with this beautiful set from Wyndham Collection. Hatton 80-inch W 3-Drawer 4-Door Vanity in Brown With Marble Top in Beige Tan, Double Basins This vanity is a great way to add traditional style to your bathroom. This piece comes with a beautiful brown solid wood base and a beige tan marble counter. Make your bathroom look like new with this good-looking, useful set from Wyndham Collection. 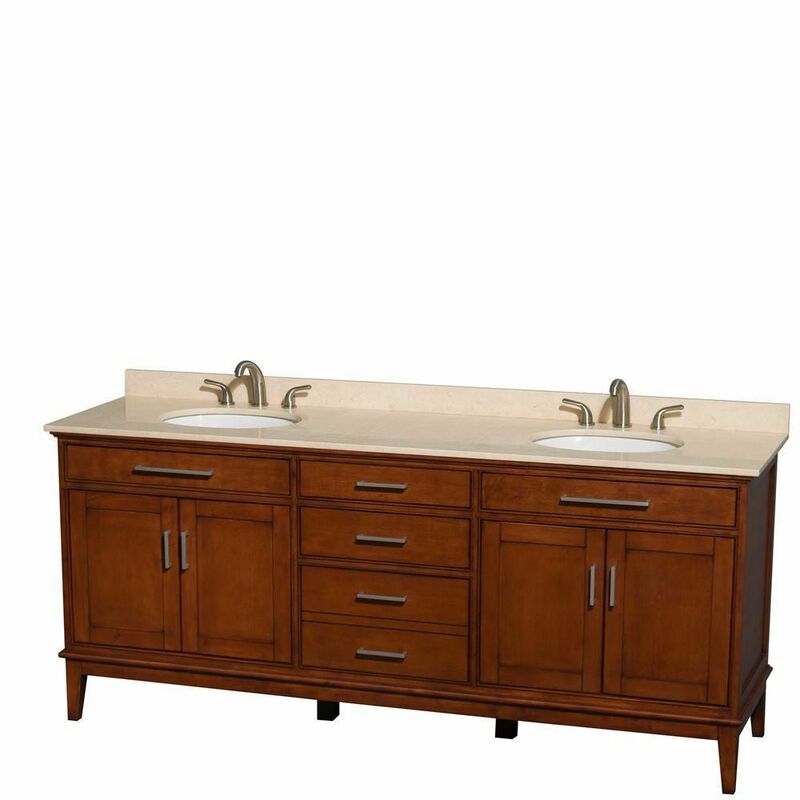 Hatton 80-inch W 3-Drawer 4-Door Vanity in Brown With Marble Top in Beige Tan, Double Basins is rated 1.0 out of 5 by 1. Rated 1 out of 5 by Musclegrl from Do not buy this ! We purchased this vanity online. My husband has been in the building business for over 30 years. The sinks do not line up with the vanity! So do not buy this vanity set We are still waiting to hear back from the company on what they're going to do about this. This set was over $2500.00 I would not recommend a set at all!